Since many cities and counties face a growing fiscal squeeze because of static or even declining tax revenues, some policymakers wonder if social programs to combat crime might be more effective than old-fashioned (and labor-intensive) law enforcement. Why spend precious dollars in the punitive exercise of catching and prosecuting killers? A new analysis conducted by the Murder Accountability Project (MAP) contains a stark warning for city and county governments that allow homicide clearance rates to decline below national norms. Jurisdictions that do a below-average job solving murders suffer homicide rates nearly double those of jurisdictions with above-average clearance rates. 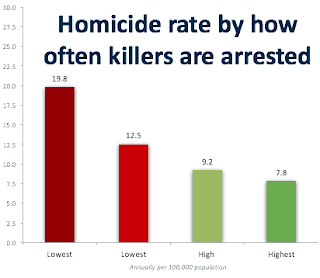 Put another way, Americans living in cities that underperform in catching killers are twice as likely to die in criminal assaults. Read the entire nine-page MAP report here. This warning is all the more worrisome since the FBI estimates homicide clearance rates in 2016 dropped to 59 percent, the lowest rate ever recorded in the United States. MAP’s analysis finds there is a broadly inverse relationship between homicide clearance rates and homicide occurrence rates. As clearance rates decline, murder rates rise and vice versa. This report contains homicide clearance and occurrence rates for 192 major police departments, comparing rates during the five-year period 2012-2016 against the rates during the previous five years.